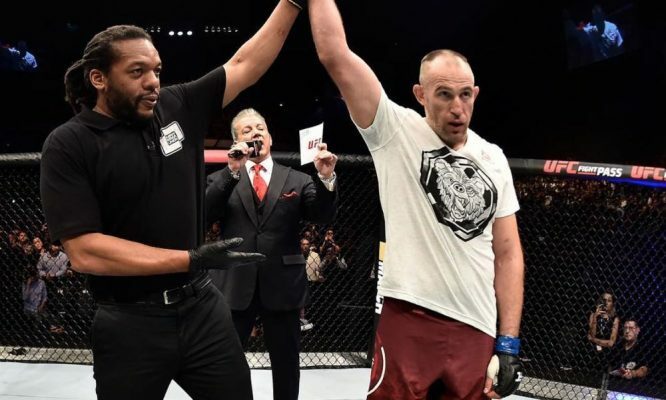 Aleksei Oleinik made his home crowd happy as he tapped out Mark Hunt in the first round in the main event for the first ever UFC card in Russia on Saturday. It had been nearly five years since Oleinik last fought in Russia so serving as the headliner for the first ever UFC card there was a huge honor for the heavyweight submission specialist. He certainly made the most of his opportunity while picking up arguably the biggest win of his UFC career. Oleinik didn’t get to his submission finish without facing some adversity early after Hunt attacked his lead leg with a series of blistering kicks not to mention a massive overhand right that blasted him flush on the jaw. While the punch seemed to rattle Oleinik for a brief moment, he was quick to recover and reset with some striking combinations of his own including one punch that put Hunt down to a knee for a split second. Oleinik was finally able to secure a takedown after pressing forward and catching Hunt in the clinch before quickly transitioning to the body lock before dragging him down to the mat. Once Oleinik had Hunt on the ground, he had no plans to let him get back up again. Oleinik was lightning fast by taking Hunt’s back and then locking his hooks before wrapping the arm around the neck and latching into the rear naked choke. Hunt had no choice but to tap out or go to sleep as the end of the fight came at 4:26 into the opening round. Oleinik has now notched two wins in a row with a 4-1 record over his past five fights while undoubtedly climbing higher in the rankings following this latest victory. “I planned and I practiced two submission victories in my preparation, but the Ezekiel choke wasn’t one of them. I definitely felt it (leg kicks) and probably three or four more could have affected the outcome of the fight, perhaps,” Oleinik said about his performance. As for Hunt, he has now dropped two fights in a row while going 1-3 in his past four performances inside the Octagon.